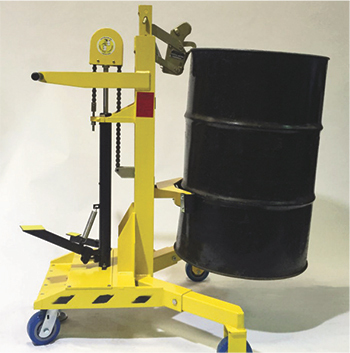 Liftomatic Material Handling, Inc., Buffalo Grove, IL, has introduced the Ergo-Matic line of portable drum-handling equipment. The line, featuring fully modular designs for efficient manual handling of a single drum, comprises a range of models for repetitive applications. Features include high-lift capability—to 36 in.—for double-stacking of drums, spark-resistant components for flammable areas and double Parrot-Beak clamps for fiber and plastic drums. Off-the-shelf and customized equipment are available. Products from Liftomatic range from hand trucks to fully powered lift, lower and position devices, suitable for steel, plastic and fiber drums. The company’s offerings can handle capacities to 1000 lb. per drum and provide various lift heights. Straddle-leg and counterbalance configurations as well as spark-resistant and EE/EX-specification packages are available. See also: Liftomatic Material Handling, Inc.